The MIG-21F is a short range day fighter-interceptor and the first major production version of the popular MIG-21 series. The MIG-21 is considered to be the most outstanding Soviet fighter aircraft designed since the end of WW II. The E-5 prototype of the MIG-21 was first flown in 1955 and made its first public appearance during the Soviet Aviation Day display in June 1956. The MIG-21 is used by more than 30 countries of the world – including nations friendly to the US. An estimated 10,000 - 13,000 copies have been built in 15 different versions. This production feat is only outnumbered by some WW II aircraft and in modern days only by one – the Lockheed C-130. First introduced in service in 1959, it continued front line service for more than 30 years. A record equal, and parallel, to the F-4 Phantom II. The MIG-21 proved itself over and over as a formidable fighter. It has seen combat in most conflicts since the Vietnam War. The MIG-21 is not known for its radar or hauling capabilities, nor for its target acquisition equipment or range. It was very much dependent on the pilot, his training and experience. This formerly Indonesian MIG-21F-13 S/N 85 was identified by the USAF as a “YF-110B Fishbed C” USAF S/N 14. 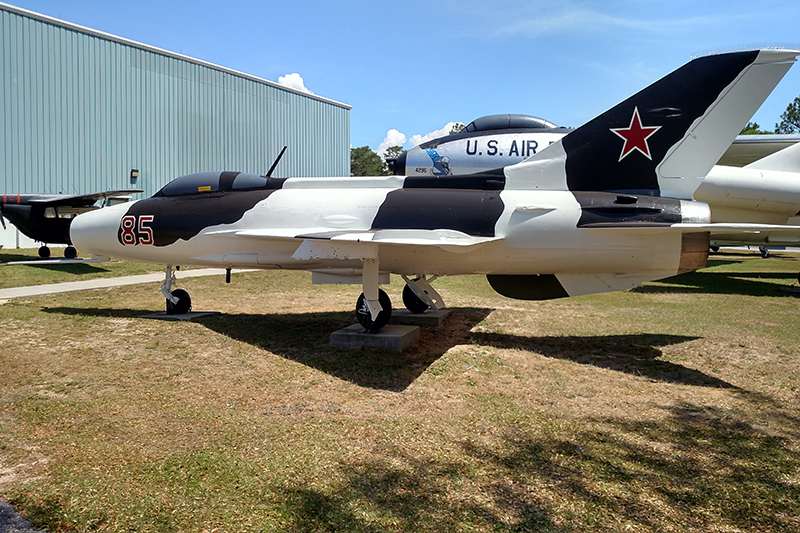 It is depicted in the USSR camouflage paint scheme used by the 4477th Test & Evaluation Squadron “the Red Eagles” during the mid-80’s. It was used during Project Constant Peg, the purpose of which was exposure of USAF, USN, and USMC pilots to enemy technology and tactics.